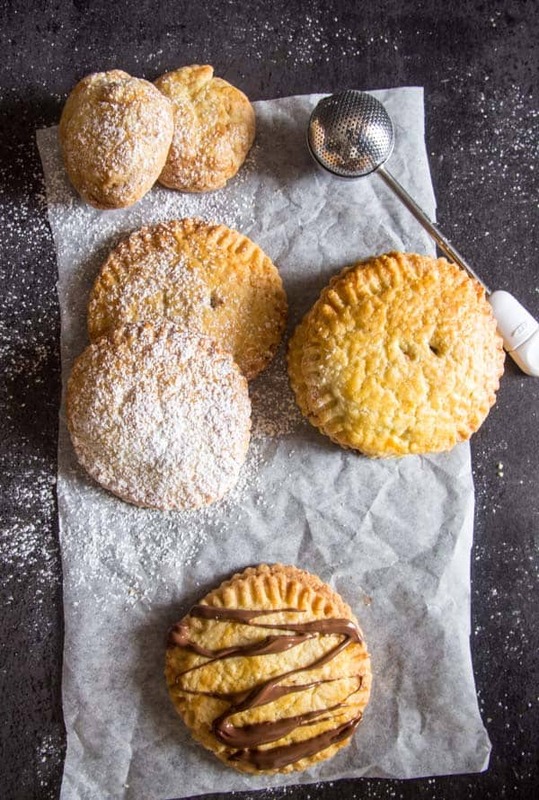 These delicious Hazelnut Cream Hand Pies, are made with a traditional Italian Pastry then stuffed with a creamy Hazelnut filling that makes them a perfectly delicious Snack or Dessert. With Christmas just around the corner I have been thinking of baking, anything, something. I remembered when a friend of ours came over one evening last summer and made his delicious cookies. I am not a big Nutella fan, but as long as it is in something (stuffed in a croissant isn’t bad either) I can go for it. My kids (as good Italian children are known to do) will eat it out of the jar with a spoon. In their early childhood I was going through Nutella by the jarfuls. And yes that is still the truth. 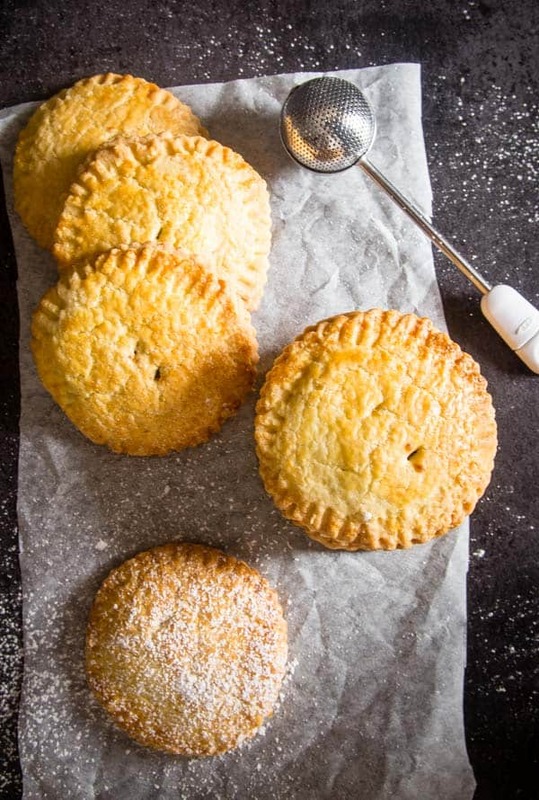 Although we have cut back on our consumption of Nutella, but whenever I make these hand pies, which at the time almost four years ago, I called them Raniero’s Cookies. My daughter just finished eating 5 of these cookies so they must be good!! Four years later and she ate another 5 so yeah still delicious! Let me tell you he has become an amazing cook and jokes that the only thing he can bake are these cookies! 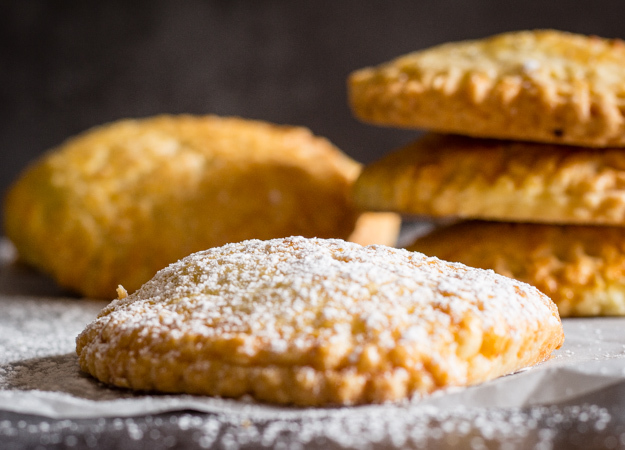 Or as I decided to rename them Italian Hazelnut Cream Hand Pies. Apparently this Italian Pastry Dough is his mother’s recipe and to tell the truth it is pretty well one of the best ones I have ever tasted. I don’t know why I try others! I made the dough in my Food Processor and it came together so quickly, I let it sit in the refrigerator for 30 minutes but you can even leave it overnight if you choose. Rolling it out I made sure I had a well floured board, mainly because it is soooo hot here and unfortunately we don’t have air conditioning. Poor me! I also made small scoops of Nutella and froze them until they firmed up, about 20-30 minutes. It seems freezing the filling keeps it from running or disappearing into the dough while baking. 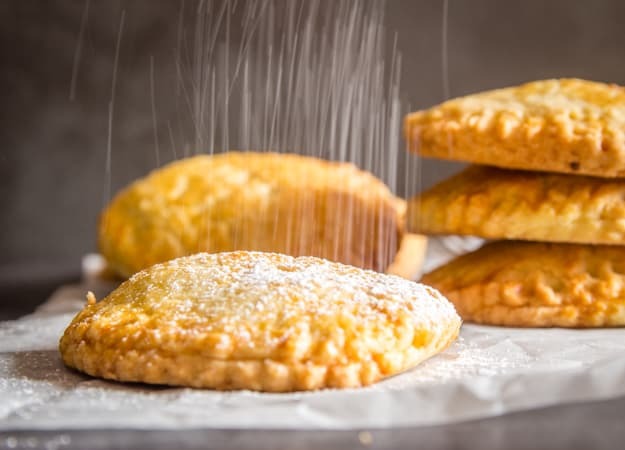 They are so good either eaten warm or sprinkled with a little powdered sugar. Enjoy! 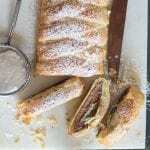 More Delicious Hazelnut Cream Recipes you may enjoy! 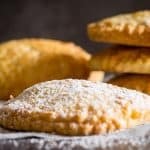 Italian Hazelnut Cream Hand Pies, a traditional Italian Pastry, stuffed with a creamy filling that makes them a delicious Snack or Dessert. 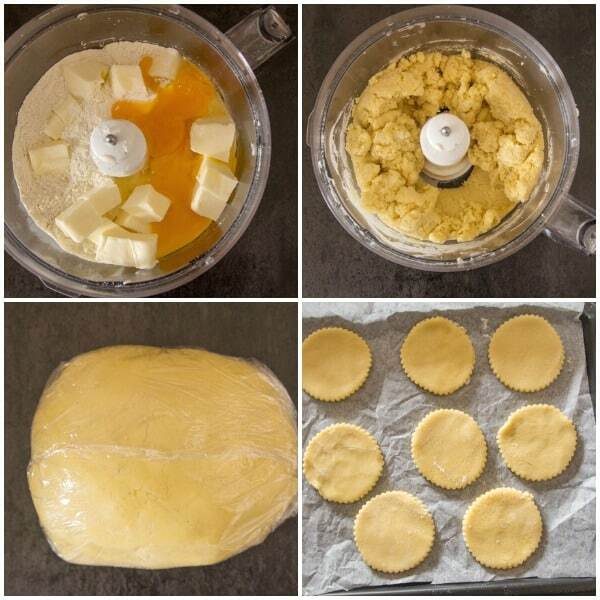 In a food processor add dry ingredients and whisk together, then add butter, egg and yolk, pulse until mixture comes together. Remove to a lightly floured flat surface and knead gently to form a soft dough. 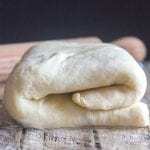 Wrap dough with plastic and refrigerate 30 minutes or even over night. 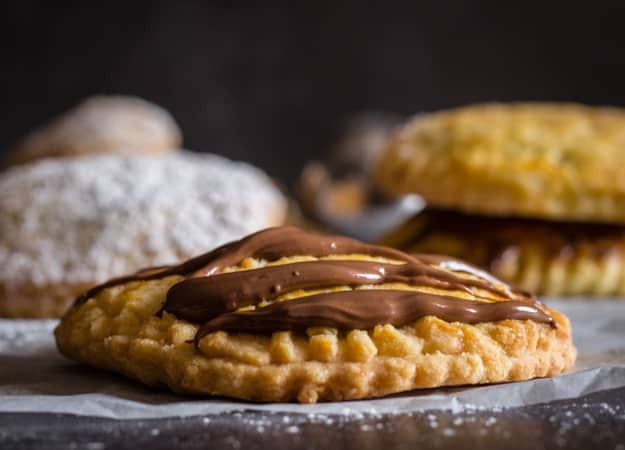 Place scoops of Nutella (hazelnut cream) on a parchment paper lined cookie sheet and freeze for at least 20-30 minutes or until firm. Pre-heat oven to 350°F (180°C). Line one or two cookie sheets with parchment paper. 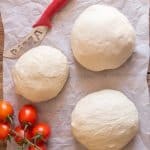 Remove dough from fridge, roll half the dough (half at a time) on a floured surface to approximately 1/8 inch thick (or a little thicker if you wish) ,(you may have to lightly flour your rolling pin) cut with round cutters, (medium 3 1/2 inch size). In the middle of the circle place a firm hazelnut cream ball, seal together with the teeth of a fork (press firmly all around the edges). Brush with an egg beaten with 1 tablespoon of water, also brush the edges with the egg wash to help seal the dough. Bake for approximately 20-25 minutes or until golden. 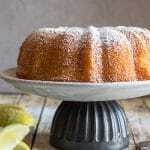 Let cool or eat warm, dust with powdered sugar if desired. Enjoy! 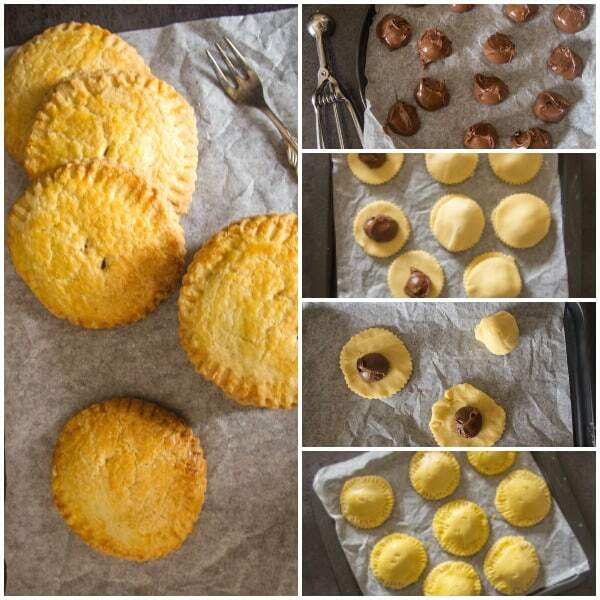 Where’s the recipe for the hazelnut filling? Hi Deborah, hazelnut filling is Nutella. Have a great weekend. These are positively lovely! I know it definitely wouldn’t be the same without butter, but I’ll have to experiment with fats to see how I can enjoy these dairy free too! Hi Alisa thanks so much, and I think the dough would work with veg. oil or even lard. Have a wonderful Sunday.